At Life’s Carousel, I write about stuff I love and I think you’ll love too. Some of my posts might include affiliate links. These are completely free to you and help support the running of this site. Do you ever look around your house and know that you should be cleaning, but YOU JUST DON’T WANT TO? Cleaning motivation is something that can be really hard to find sometimes! The good news is that you are not alone! 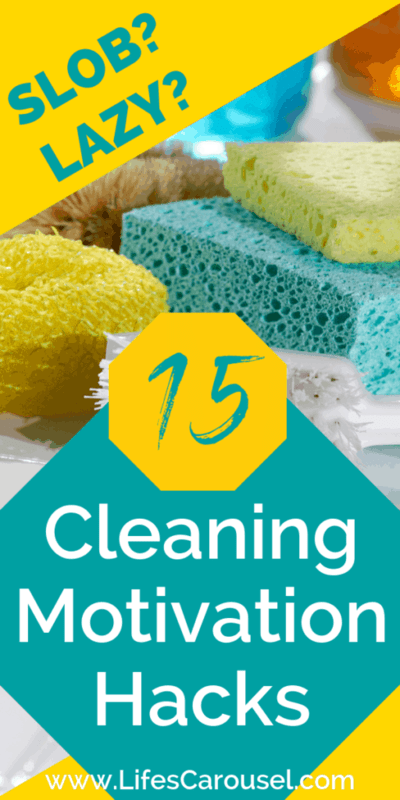 It doesn’t matter if you struggle with cleaning or your home is generally neat and tidy, we all have days where we know we should clean, but we just don’t have the energy to do it. A messy house can affect us in many ways. Yes, it is tough to stay organized if your house is untidy (where did I put my keys again? ), but it can also affect other areas of our life too. Maybe you have constant fights with your spouse or children about the mess? Perhaps you suffer from allergies or frequent illnesses because of the dust at home (even a small amount of dust can make you sick). What about just the effect that stress has on our mind and bodies? Being stressed about your home is not a fun way to live. Cleaning motivation is the answer to a lot of our problems, but finding that motivation can be difficult. I’ve talked before about step-by-step systems to help you get motivated to clean and how to clean when you feel overwhelmed. 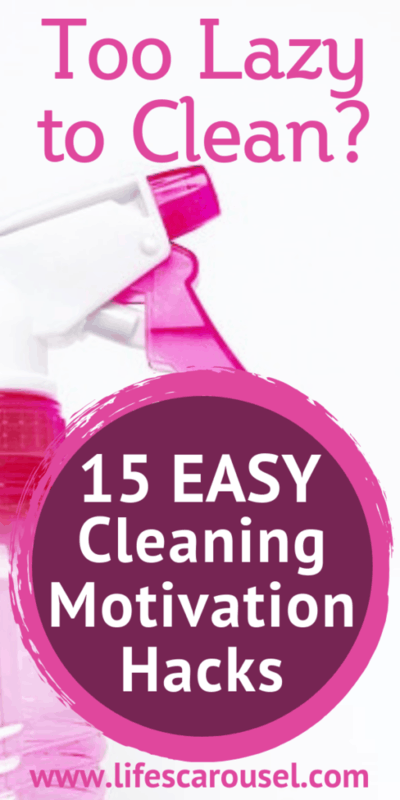 But this post looks at simple and quick steps you can take to jump-start your cleaning motivation right now! No matter the state of your house, we all need a little kick up the rear end sometimes! I (just about) manage to keep my home pretty neat and tidy most of the time. But some days (or weeks! ), I just don’t have the energy or mindset to clean. My house gets messy and then I get stressed. The more stressed I am, the harder it is for me to clean! The cycle goes on and on! In fact, I talk about the stress-cleaning cycle in my post about cleaning when you feel overwhelmed by the mess. These are quick and easy tips you can use any time without a lot of planning or work. They will help kick-start your mind into actually WANTING to clean, instead of just doing it because you have to! You’ve probably heard this one before. But playing your favorite upbeat songs will definitely help you feel like moving a bit more! Turn it up loud and rock out while you push the vacuum around! Bonus – the noisy of the vacuum will drown out the sound of your singing! You’ll be surprised how much you can get done in a short space of time. Think about the day before you go on vacation. Isn’t it amazing how much you can squeeze into one day? Set a timer for 15 minutes and challenge yourself to do as much as possible. And just stop when the timer goes off, no need to keep going. Make a list of all the random cleaning tasks that you need to do (dusting baseboards, cleaning light fixtures) and pick just one or 2 of those items. Don’t worry about doing anything else, just those couple of things. We all have one thing that stresses us out more than others (I talk about it a lot in my Quick Cleaning Tips post). For me, it’s my floors. If the floors are dirty then I get really stressed! Find your Stress Trigger and tackle just that area. It will make you feel so much better! If you just can’t seem to get off the sofa to clean, then close your eyes and imagine your home when it is neat and tidy. Image what it smells like, how it feels and how nice it is to relax in the space. Before long you will want to get up and clean, so you feel that way in real life! Still lacking some cleaning motivation? Spend some time looking at photos of pretty homes on Pinterest or in magazines…. but remember that those “perfect” homes aren’t real! It’s OK that your home will never look like a spread in a magazine, but you can at least take some inspiration from it! This is probably my FAVORITE tip! If you just feel like your living space is stale and you have no desire to make it look nice, then try moving around your furniture a bit. Just switching up the location of your sofa or dining table can make a room feel totally different. It will re-energize you and encourage you to find your cleaning motivation! It’s amazing how quickly we can clean when we have company coming over! 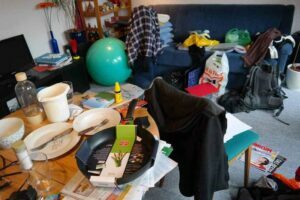 No-one wants to welcome their friends into a messy home (even though we know that our true friends don’t care about the mess!). So call up your friend and see if she wants to stop over for coffee (or wine!) in a couple of hours! Sometimes our homes are so messy that we can’t get motivated to clean because things are so bad. Why not find a local cleaning company or housekeeper (Craigslist is a good place to start) who will come to your home for 3 or 4 hours and help jump-start your cleaning routine. It’s amazing what we will do when we have the right motivation. Why not promise yourself a bowl of ice cream or an extra episode of your favorite TV show…. if you finish cleaning the kitchen first! This is a great way to get the whole family involved in cleaning! Set a timer for 5 or 10 minutes and challenge the whole family (with a prize for the winner if needed!) to clean as much as they possibly can in that time. I do this a lot with my kids… I even shout at them if they try to start cleaning BEFORE the timer starts! Ready… set… go! Picking out a new cleaning product might help you get a little more motivated to clean. I normally make my own vinegar based cleaner (tip #2 in my Quick Cleaning post), but I LOVE the way that Method cleaning products smell. My favorite is the Grapefruit multisurface cleaner. It makes my home smell so good that I try to find MORE things to clean! The old saying “a problem shared is a problem halved” is true for cleaning too! If you just can’t face cleaning your home, then ask a friend or family member to help you out. Working on it together (with loud music!) will make the job go quicker and you can have some fun along the way too! “Starting small” seems to be my default advice for pretty much everything! But it really does work. Sometimes we just take on too much work. Instead, pick one small area to focus on and get that clean first. Your kitchen sink, the top of your dresser or the area by your front door. Doesn’t matter where it is, just focus on getting that one area looking nice! It doesn’t matter what method you use to jump-start your cleaning motivation… what matters is that you find a way to overcome your apathy and release your inner cleaning goddess! GReat ideas! Some I already use and now I have some new ones for the New Year! Happy New Year! Glad you found the list useful! Great tips! I would add watching clean with me videos on YouTube. I recently began doing this and it actually makes cleaning fun. Oh, yes! Those are great fun to watch and great motivation!